My heart beets for you. It really does. You're my motivation and inspiration for so many things. Without you, this blog would not be possible. Without you, this cake would not be possible. You see, I hate beets. Cannot stand them. 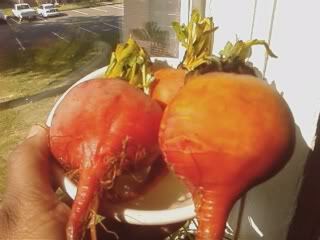 The mere sight of the knobby root of beet makes me steaming mad. Golden beets. Hate them too. I've used them before in recipes, but I cannot in good faith bring myself to eat them. But I can bring myself to eat this cake. I love cake. I love cake almost more than anything. I have a hard time identifying my favorite foods, but I think cake is it. This cake in particular. 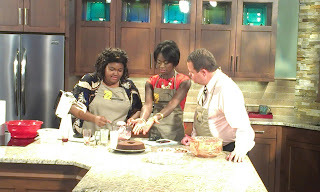 So, I searched all over for a solid Chocolate Beet Cake recipe for my client. Red Velvet was out of the question due to the obscene amount of food coloring it needs. Beets are red. I've heard of beet chocolate cakes. Let's look for one, I thought. I looked at David Lebovitz, Martha Stewart, Nigel Slater and a host of others. None seemed to be good. So, I made up my own. I took what I liked and left what I didn't and cake up with the perfect cake. Not only is this cake perfect to eat, it's perfect to make on live television. 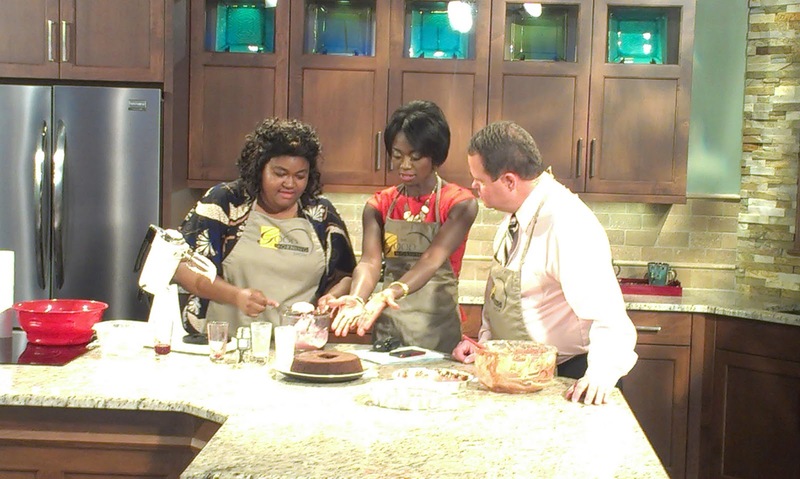 Check out my on-air appearance on WFMY 2 HERE. You can see how easy this cake is to make. And you can laugh along with me as I try to make jokes about my ghetto mixer. Place a rack in the center and upper third of the oven. Preheat oven to 350 degrees F.
In a medium bowl, whisk together flour, cocoa powder, baking soda, baking powder, and salt. Measure 3/4 cup of beets for the cake and reserve 1 Tablespoon beet juice for the frosting. Set aside. Use butter to grease two 8 or 9-inch round baking pans. Trace a piece of parchment paper so it is the same size as the bottom of the cake pan. Cut it out and place inside the cake pan. Butter the parchment paper. Add a dusting of flour or cocoa powder to coat the pan. Set pans aside while you prepare the cake. In a large mixing bowl using a hand mixer or the bowl of an electric stand mixer, fitted with a paddle attachment, cream together butter and sugars. Beat on medium speed until pale and fluffy, about 3 to 5 minutes. Beat in eggs or egg substitute, one at a time, for one minute after each addition. Stop the mixer and scrape down the sides of the bowl as necessary. Once eggs are incorporated, beat in beets and vanilla extract until thoroughly combined. Add half of the dry ingredients to the butter and egg mixture. Beating on low speed , slowly add the buttermilk. Once just incorporated, add the other half of the dry ingredients. Beat on medium speed until milk and dry ingredients are just incorporated. Try not to overmix the batter. Bowl can be removed from the mixer and mixture folded with a spatula to finish incorporating ingredients. Cake batter will be thick. Divide the batter between the two prepared cake pans. Bake for 23 to 25 minutes (for a 9-inch pan) or 30-32 minutes (for an 8-inch pan). Cake is done when a toothpick inserted in the center comes out clean. Remove cakes from the oven and allow to rest for 10 minutes. Invert cakes onto a cooling rack to cool completely before frosting and assembling the cake. In the bowl of an electric stand mixer, fitted with a paddle attachment, beat cream cheese for 30 seconds, until pliable and smooth. Stop the mixer and scrape down the bowl. Add the beet juice, powdered sugar, vanilla extract, milk, lemon juice. Beat on medium speed until smooth and silky. Refrigerate the frosting for 30 minutes before frosting the cooled cakes. The cake will keep, if refrigerated, up to 4 days. I'm not a big fan of beets either, but your cake looks yummy! Thanks, Beth! It's the most delicious, moist chocolate cake I've ever had. It is number one on my top foods I've ever had, involving foods I hate. 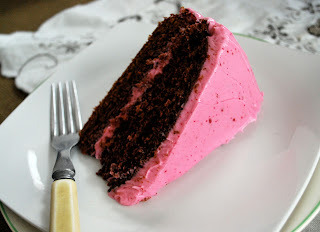 I have another beet post coming later in the spring... but nothing holds a candle to this cake. I have been waiting for this recipe ever since you mentioned it at our lunch together. It's HIGH on my list of must-try recipes! Thank you for sharing it!